The recent article by the Chosun Daily on the Global Peace Foundation’s work in Kenya commended the impact of the Character and Creativity Initiative (CCI) in Kenyan schools. The following is the presentation that Tony Devine gave at the Global Peace Convention 2012 on the specific projects that CCI has sparked in schools around Kenya. Some have even garnered recognition from the UN. LeadIn, the lead organization for CCI also has pilot programs in the United States and Ireland. Good morning everyone. It is a pleasure to be with all of you today. 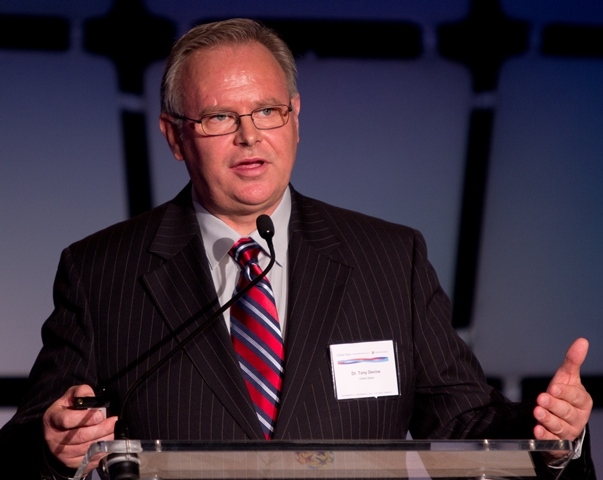 Tony Devine, Executive Director of LeadIn, a Global Peace Festival Foundation (GPFF) initiative, presents at the Global Peace Convention 2012 in Atlanta, Georgia. Stephen Covey who wrote The 7 Habits of Highly Effective People always said, “Keep the end in mind,” So in the world of education, what are employers of the 21st century looking for? Two recent reports, have come out called Job Outlook 2012, by the Association of Colleges and Employers, and Are They Really Ready to Work by the Conference Board and the Partnership for the 21st Century Skills. What are these employers, whether it be small businesses, medium, or large looking for in their employees? They are looking for young people; looking for employees who are ethical. They are looking for ethical workers, people who can be trusted with their clients and so on. They are looking for people with good communications ability. They want people who can actually learn on the job, and continue learning – learning does not stop when you graduate from college or high school. They want people who are motivated, who can actually take initiative. They are looking for people who can work with others, have the ability to solve problems, have good interpersonal skills, have a positive attitude, and are dependable. Now you don’t see here in this list, “We want people who have an A in geography, an A in math, a B+ in science.” These are the qualities that are desirable. In Kenya, there are six million young people who are out of work. We have university students shining shoes on the side of the street. In response to both of these points, the Global Peace Foundation together with the Ministry of Education, Oxford University Press, and other really terrific partners, have come together, and have decided to tackle this issue of education by putting an emphasis on non-cognitive skills, building character and creativity. Something that schools do a very poor job of globally. This initiative empowers students to be successful, not just in school, but in the world of work, even in their own lives, in their community. It focuses on building character strengths that are even more important than IQ. And also to have the freedom to develop creativity and leadership. , This is done by creating a high performing and caring culture in the schools. It’s supported by a national council that is made of the Ministry of Education, Brand Kenya and many other terrific partners. What are some of the outcomes of this? You have teachers coming into schools now with a smile on their face, teachers who are going beyond the boundaries and restrictions of their role of teaching, to care, and to raise the whole child. In Our Lady of Fatima High School in Nairobi, one teacher started an initiative called “Talk to Me”, where students can come up to her at the end of her class in the evening and talk not just about academic issues they are struggling with, but even personal, familial issues. It’s bridging this gap between teachers and students in a caring way. At Moi Forces Academy High School in Nairobi, it’s a military school, all of the 960 students are doing the One Percent of Change and Peace. Dr. Moon addresses members of 1% for Change and Peace at the Moi Forces Academy during the Global Peace Festival in Nairobi, Kenya in 2010. They are actually dedicating one percent of their time, talent, and resources to improve their school and the community surrounding their school. Now in Kenya the academic year has ended. These students are going back to their communities across the country and they are doing the One Percent of Change and Peace in their local home communities. Right across the nation of Kenya, social enterprise has begun at Langata High School. A group of students got together and they created a small company. They produce eco-friendly charcoal out of waste paper, and they sell that to the vendors and people surrounding the school. In the process, they are learning these 21st century skills of character, leadership, creativity. This is Supporting Peers in Need. In our partnership with the United Nations Environmental Program, this student from Our Lady at Fatima High School got invited to go to an environmental conference in Indonesia last year. When she came back, she was so inspired by all of this. She didn’t have a birth certificate in order to get her passport. She never left her community and all of a sudden she’s representing Kenya at an international conference. When she came back to her school, she started a program to raise funds to help pay for the fees of needy students who come from the slums surrounding this school. She put together a committee of students, high school students. Not only did she help pay for the fees, but also for food for students who are coming from needy families, and even pay for a pair of shoes. They decide and determine who gets what. 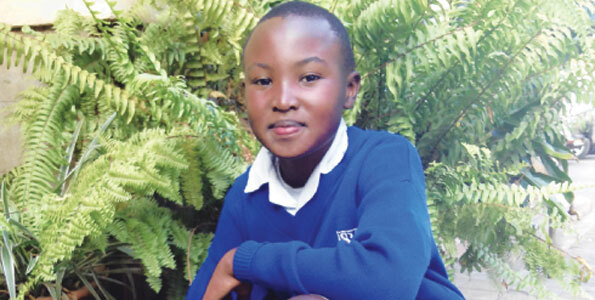 You have a case of this twelve year old student, Stephen Njoroge, who felt that something more needs to be done to improve the environment. He started an initiative by planting a few trees. This led to the planting of 10,000 trees through a group of fellow students, his own age that they call the We Care Club. It was recently recognized by the United Nations. In Buru Buru Girls High School, the girls in that school are planting trees, and they are associating virtues with the trees. So for example, one student might call her tree, the new sapling, the virtue of generosity. When she goes out to check on the tree every few days, she is also assessing,“Am I growing in my sense of generosity to others?” in a comparable way to how the tree is growing. Over the last year and a half, 900 teachers and school principals have been trained in the Character and Creativity Initiative. We focused in on seven capacity building schools. This year this has expanded to almost 2/3 of the high schools, the public high schools in Nairobi County. And in August of this year, it is expanding to all 48 national schools across the country. The program is being evaluated by the Kenya Institute of Public Policy Research and Analysis. We have some preliminary results, the formal report will be coming in about a month. But according to data from the Ministry of Education, the schools that are doing the Character and Creativity Initiative have demonstrated improved academic and student achievement compared to their cohorts. Also, they have reduced disciplinary problems. In one school, the disciplinary problems have been reduced to zero. So the vice principal has nothing to do anymore, he’s out of a job. And of course, it improved the learning environment. Partners are coming out of their organizational silos to increase a much larger impact on student achievement. I want to thank you very much on your attention.